Acknowledged author Paul G. Farnham wrote Economics for Managers (3rd Edition) comprising 552 pages back in 2013. Textbook and etextbook are published under ISBN 0132773708 and 9780132773706. Since then Economics for Managers (3rd Edition) textbook received total rating of 4 stars and was available to sell back to BooksRun online for the top buyback price of $82.77 or rent at the marketplace. For students in the one-semester MBA Managerial Economics course. 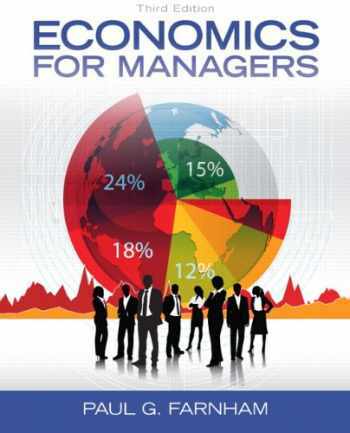 This book is also suitable for all readers interested in the field of managerial economics. ¿ Economics for Managers presents the fundamental ideas of microeconomics and macroeconomics and integrates them from a managerial decision-making perspective in a framework that can be used in a single-semester course. ¿ To be competitive in today’s business environment, managers must understand how economic forces affect their business and the factors that must be considered when making business decisions.¿ This is the only book that provides business students and MBAs with a thorough and applied understanding of both micro- and macroeconomic concepts in a way non-economics majors can understand. ¿ The third edition retains all the same core concepts and straightforward material on micro- and macroeconomics while incorporating new case material and real-world examples that relate to today’s managerial student.